A team from BPC Building Products is taking part in ‘The Lois Lanes’, a coast-to-coast walk to raise in excess of £15,000 for Lois Huntingdon and the Forget-Me-Not Children’s Hospice. Lois is a happy, lively and courageous young lady, who has an undiagnosed neuromuscular condition and severe learning disabilities that she has battled since birth. 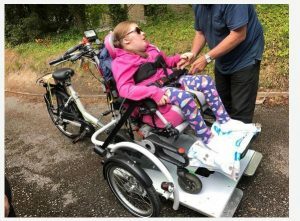 The aim is to raise £7,000 for Lois, which will buy her a new wheelchair transporter bike, providing her with hours of great pleasure as she has outgrown her current bike. The remaining money raised will go directly to Forget-Me-Not, a pioneering children’s hospice serving families across West Yorkshire & East Lancashire. Forget-Me-Not has been a huge support for Lois and her family over the years. On the weekend of April 6-8, 2018, over 2-days and 2-nights, teams of volunteers will join friends and relations of the Huntingdon family, to take part in the 160 mile walk from The Deep in Hull to the Pier Head in Liverpool. Thank you for you kind support.